You are here: Home / Dessert / It wouldn’t be Christmas without… Pavlova! It wouldn’t be Christmas without… Pavlova! 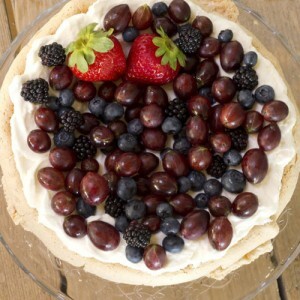 The quintessentially Kiwi dessert, Pavlova, is fast becoming a modern Christmas tradition. Made all the better because berries are plentiful, and local ones are just coming into season. Heat the oven to 180ºC, don’t use the fan. Line a baking tray with baking paper and mark a circl;e about 16cm diameter with a plate. Put the egg whites in the mixer and whisk. Add the salt and beat until stiff. Slowly add the sugar with the beater running. (I find it best to add about a dessert spoon at a time). Continue to mix for 10 minutes at high speed until the meringue is thick and glossy, (it should be firm enough to stick to the beater). Finally fold in the cornflour and vinegar. Drop spoonfuls of mix into the circled area, shape the outside into a smooth circle and leave the top textured. Bake at 180ºC for 5 minutes then reduce the oven temperature to 130ºC and cook a further hour. Turn off the oven and leave to cool in the oven. This can be made a few days ahead and then kept in an airtight container. To serve, cover with whipped cream. Get an assortment of berries, chopped strawberries, whole raspberries, currants, blueberries, etc. Lightly combine them, squish a few to make a light compote and scatter over the top.